Let me begin by thanking Steve and Pat for such a great site and for making this resource available to the knitting community! I’ve only been knitting a few months, but when I chanced upon Woolly Thoughts, I was amazed by the designs and the knitted artwork they’ve been able to create. I was further impressed with the detailed tutorials they created to explain illusion knitting and I read through all of them to prepare for my first attempt at one. It was while reading Steve’s “Tiger” tutorial that I noted his comment about having to knit “test swatches” for difficult sections, and admired his diligence and patience. But it’s that attention to detail that sets their work apart, I’m sure. At any rate, I was on the bike trainer at the gym the next morning when I got to thinking about knitting illusion test swatches. With all of the 3-D modeling programs out there, I thought there ought to be something that could simulate the garter ridges and stockinette stitches that form the basis of illusion knitting. I had to wait until I got back to my office to do an Internet search, but luck was on my side. One of the first results was for a 3-D modeling program for Legos. My grandson loves Legos, so I thought there was a good chance the program could do what I wanted. Downloading and installing the program was a breeze. The Lego site has a number of instructional videos guaranteed to get you up to speed quickly and rather painlessly. (A sidenote – at 50, I’m not as software savvy as I used to be, but this really was fairly intuitive.) 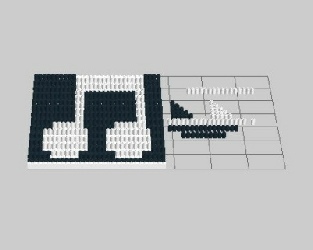 Before I knew it, I had “digitally knitted” a swatch based on a free “8th Notes” pattern I found online. 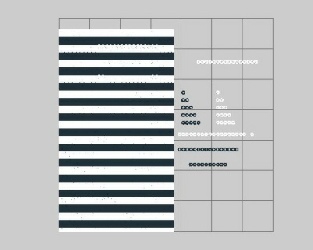 I snapped a screenshot of the finished swatch and sent it to the Woolly Thoughts site, explaining how I had used the Lego program to create the image. Steve was very gracious in his response (given the simplicity of the design that I sent compared to the intricacies of his work!) and said he would investigate further. Steve used the program to make a test swatch of the Mona Lisa eye (and while doing so, improved on the way I went about making the “stitches.”) His results were impressive, to say the least. It looks like we had a winner. If you’re looking for a way to map out difficult sections of your illusion knitting designs ahead of time — without have to knit and rip back sections — give the Lego 3D Modeling program a try!